Nice post! I have been wanting to design an ultrasonic range sensor from first principles for a while now. I’m interested to know more about design process. Why the choice of such a bridge for the transmitter and the filter circuit around the receiver? Did you review any app notes or other literature? 1. Using a bridged amplifier doubles the driving voltage and thus increases the output power. 2. 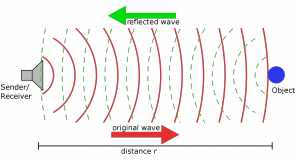 Because the ultrasonic signal I am using is centered around 24 kHz, using filters around that frequency ensures that only the signal of interest gets amplified and thus reduces noises. Rather ws sign in depth info. I am really glad to read this short article. Thanks for giving people nice articles. You may be able to get that 1ms delay down (i.e. measure closer objects) if you add some dampening resistance across the transducer. A tuned circuit would work better than a resistor but more of the energy intended to go to the transducer would go to the dampening circuit as well, and you may have to worry about creating a tank circuit and causing oscillation. Awesome! I think I just bought those exact same transducers!! All electronics? Thanks for paving the way! Amazing! Thanks for sharing, I might have to try and build this now. Can we transform the code into Arduino library? I have no experience in making library. Could you help us transform the code into Arduino library. Then upload it into Arduino/Playground. Thanks for the suggestion. I’ll refine it a little bit and try to come up with a library when I get a chance. In the mean time, you could just copy all the code and use it in your Arduino code. Please check the ‘H’ Bridge Schematic. The 2N3906 Transistors are incorrectly oriented. The Emitter and Collectors need to be swapped. Good catch! Just updated. Thanks! In the schematic for the receiver, why does the signal from the transducer not get shorted directly to ground? It seems like the path of least resistance leads directly to ground on the bottom side of the transducer. Keep in mind that the transducer has very high impedance. Johnny, could you elaborate please… would this affect range and accuracy significantly? could you post a mod’ed cct diagram? The receiver jpeg appears to have a connection missing. The pin 1 of the left opamp is not connected. Why did you choose the 6.8nf cap in the receiver? Yes Bob, I noticed the missing pin yesterday and had corrected the drawing. The 6.8nF cap along with the 1.2K resistor form a first order high pass filter which has a cutoff frequency of 19.5 kHz. It doesn’t have to be precise but you should recalculate if you are using a different value to ensure that the cutoff frequency is outside of the operating frequency. Good suggestion. I believe ATmega328 certainly has the processing power to do autocorrelation. I will have to try this out. Stay tuned. Don’t think that would work. For multiple reasons. The transducers don’t have enough of a bandwidth (they’re usually extremely narrow banded). The timings can get extremely tricky. Finally, for anything except the simplest matched filter (just a correlation between the echo and the time-inverse of the chirp) you’d need some hefty FFT processing and convolution. Which, i think (but might be wrong), is outside the capabilities of a humble (but versatile) AVR. How about a CPLD/FPGA + MCU combo? Great work, congrats. I really love the care you put in explaining everything. 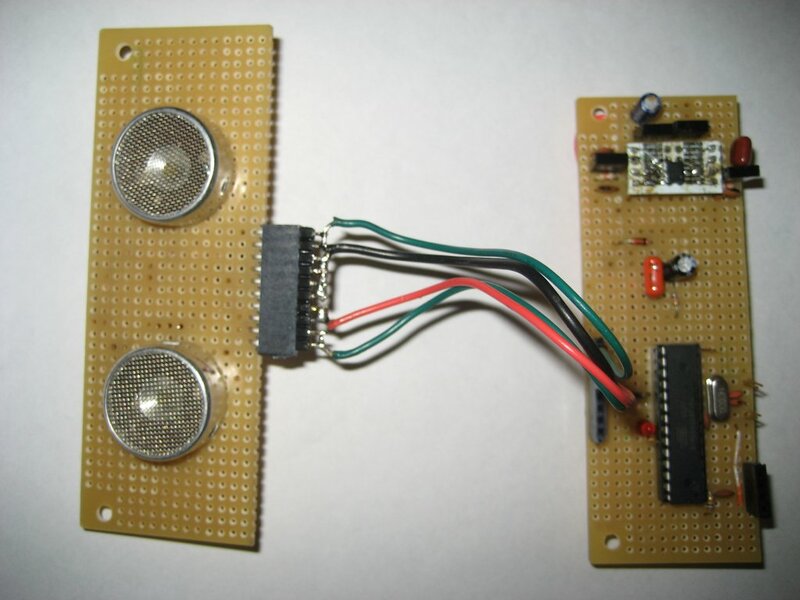 I am interested in making such a sensor to detect the distance of the sensor to a water level. However, I have to place the sensor very close to the waterlevel. The range is 1” to 5”. You have shown in the picture “Demodulated echo” that the receiver picks up a signal when the transmitter transmits, and that is why you add 1ms of delay. This of course is killing if you want to measure 1” distance. 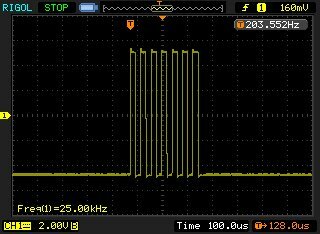 Could you tell me what the reason is that the receiver gets this signal? Is it because receiver and transmitter are mounted on the same PCB and thus pick up vibration through the PCB? Is so, do you think that putting the receiver and transmitter on different brackets would help? 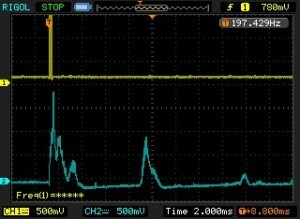 Can I substitute the LPC662 with the LM358? Thanks. 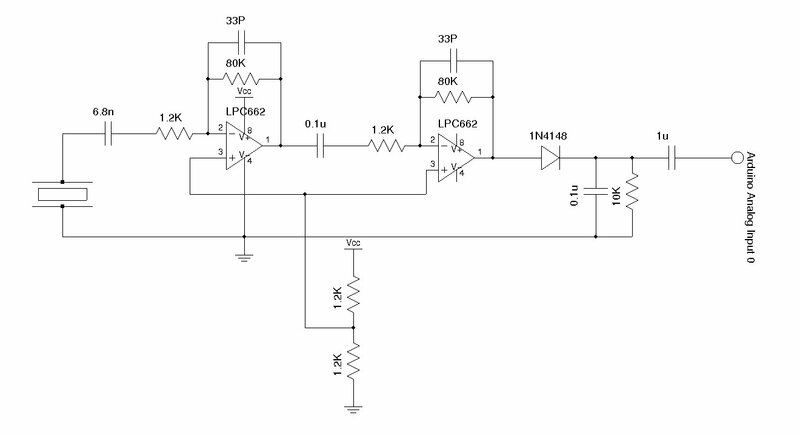 By looking at LM358’s datasheet, it seems that you’d have no issue using it instead of LPC662. Awesome article! Just one small design consideration: the H Bridge is not actually doubling the voltage, but inverting the voltage across the transceiver very quickly, making 10 v pk-pk. While this does boost the range of the transceiver, it will also mean a constant current draw, even while not transmitting. In low power/battery operated circuits, adding some kind of toggle while not transmitting would improve battery life/power efficiency. Where did you purchase the transducers? You can check allelectronics or goldmine-elec. I bought them on-sale. I’m pretty new to this .. so here comes the my question. 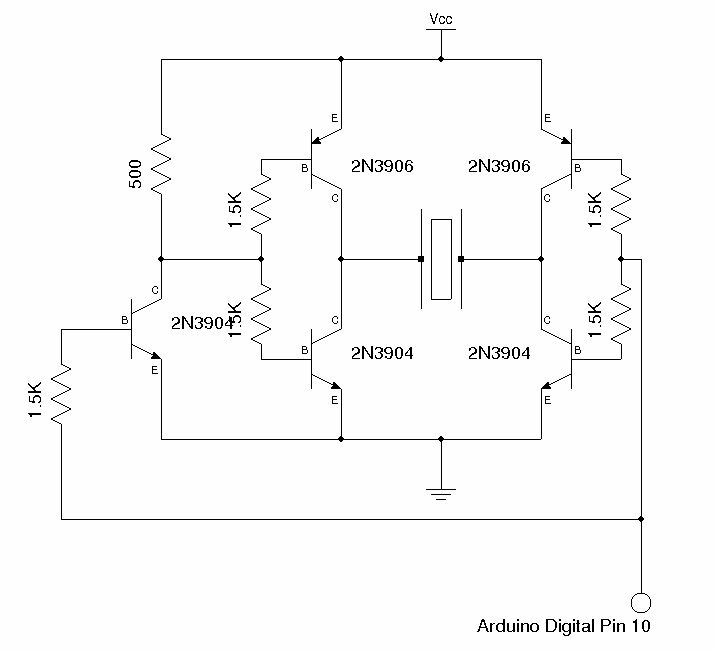 I do not understand that at the schematics it refers to Arduino digipin 10 analog and analog pin0 and the code reads the Arduino pin 9 and 10? I have built the range finder and is almost ready to test it. The digital pin 9 and digital pin 10 (referred to in the setup code) corresponds to ATMega328’s pin 15 and pin 16. The analog pin 0 (referenced in analogRead) is the chip pin 23 (analog input 0). If you still have questions, I’d suggest you take a look at the reference here (http://www.arduino.cc/en/Hacking/PinMapping). it’s probably me who misunderstand something here. what about digital pin 9? 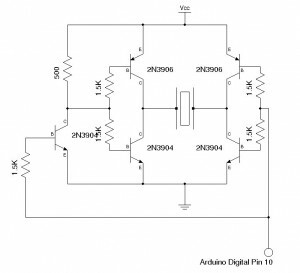 Digital pin 9 and 10 are used by timer1 on ATmega328, so even though I only used pin 10, pin 9 is affected by the fact I was using timer1. You are correct, it is not connected anywhere in this particular application. Thanks for sharing this, kwong! This was a project I had been pondering for awhile, but I thought it might have been beyond my abilities. I certainly wouldn’t have been able to design the receiver circuit. I ordered enough parts for 10 transmitters and 10 receivers. Right now, I’m just waiting for the ultrasonic transceivers to arrive from Electronic Goldmine. I plan to make just one of your rangefinders in order to familiarize myself. After that, I’d like to tinker a bit. I’d really like to try implementing some type of beamforming from 2 or 3 transmitters. I’m also thinking about trying to triangulate the position of a transmitter using multiple receivers. They both sound like relatively straightforward trigonometry problems, but I have a feeling it might not be so easy. I’ve got one built and working with an MSP430. The longest distance available for me to ping from my workbench is 15 feet, and that works surprisingly well at only 3.3V! Sir, may I ask if you have made this circuit worked? uA741 has relatively low bandwidth-gain product and in my opinion is not suitable for this high-gain application in the ultrasonic frequency range. Thank you for the very nice presentation, Sir. I’ll be creating one in a few days and I’m very excited to see the results. I have a couple of questions though. One, regarding your Rx circuit. Only 40kHz transducers are available in my area and I’m not inclined on shipping stuff for a simple project. 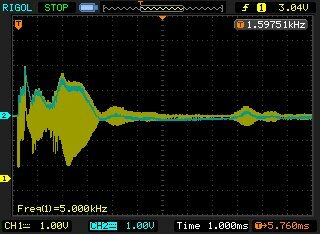 So, aside from the RC pairs that control the cut-off frequencies, is there anything else I must adjust/change if I were to work with a 40kHz transducer? The other one concerns the microcontroller. I only have an Arduino Mega at my disposal. Will the resolution of its micros() command be equal to the resolution using yours? Will this affect ranging calculation? 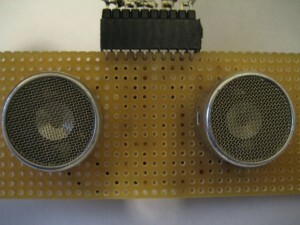 The Arduino Mega uses an ATmega1280 and operates with a 16MHz clock. Thanks in advance for the helpful response! You will need to change the timing in code to ensure that the transmission frequency matches that of your transducer (startTransducer function). In terms of ATmega1280, yes the timings between ATmega328 and ATmega1280 are identical. Did you use an oscilloscope to view the output waveform? Also, did you change the RC constants to compensate for the 40kHz ultrasonic sensor? Depending on your particular application, you might need to use an LC filter to decouple your power source (I updated in a post here). Also, for the Op-amp voltage divider, you can add a bypass cap to improve the virtual ground stability. I’ll post the parameters for 40KHz operations later today. If you don’t have a scope handy, it will be a bit tricky to pin-point the problem. I would highly recommend you test your amplifier with a signal generator first (i.e. output a 40KHz pulse @1mV and measure the output to see if you get any clean output). the 33p 80K low pass filter can be left alone as by design, the allowable bandwidth is higher than 40kHz. Hello 6.8n with 4 k gives 39.8 Khz for the first high pass, but 0.1 uf with 4 K is only 398 hz, so why is so low the second high pass? Also with LM358 it outputs to arduino Analog between 400 and 500( with 1024 max), and using your emitter or the one in HCSR04 module or another one the output only reaches 600. So, it’s not enoght amplification on reciever? or I must call ghostbusters to see what produces the 400 in my home? thank U sir for all your help and support. i finally got the circuit working. the min distance that can be measured is 19cm……. Glad it worked. 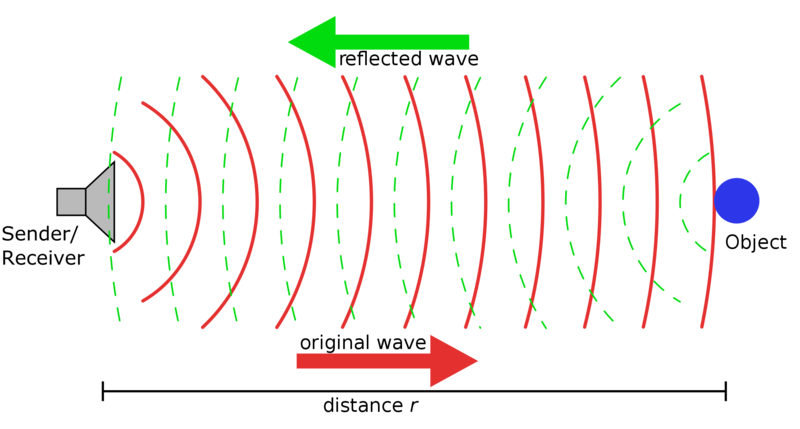 The sensitivity of the transducer may vary from brand to brand. If you could (you need to consult the datasheet), you can drive the transducer at higher voltage (e.g. 12V) and that will significantly boost the range. The GH-311 ultrasonic modules are rarely available now. I dont know whatz the reason behind it. If this project would be modified to use with some small microcontroller, certainly it will be easier to construct as well in the pocket. 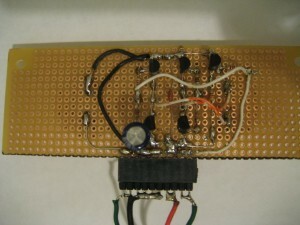 ATtiny 13, PIC12F508, AT89C2051 or any such micro may be considered in place of costly Atmega 328. Hi! Thank you for these schematics, source code and for the description of this circuit. I think, I am going to build this, becaouse this is cheaper than the Parallax Ping))). I have a few thing what I would like to know first. 1., There is a 30cm ~1 feet black spot (shortest measurable distance) in this project. Can I reduce this distance somehow? Like reducing the 1 millisecond delay to 500 microsecond or some other way? For me ~15cm ~0,5 feet shortest measurable distance would be enough. 2., The 2N3904 and 2N3906 transistors can get warm during normal operation. The 5 V VCC is enough for me (20 feet distance is almost too much). I would like to play it safe so what kind of transistors should I use to reduce the heat dissipation? 3., Where I live the 2N3904 and 2N3906 are a little hard to buy. Its not impossible, but I would like to something wich is easyer to buy. Thank you for aour help! In order to reduce the blind spot, you will need to add some sort of dampening circuits (i.e. RLC) in parallel with the transducer. Even so, it would be quite tough to reduce the blind spot down to 15cm with a maximum range of 20 ti 30 feet. But if you only require a range of 5 feet, you can reduce the driving power (e.g. drive with a single transistor instead of the bridge). In terms of the choice of transistors, pretty much any general purpose transistors with an Ic larger than 200mA and BVceo greater than 20V should do the job. I don’t want to measure things wich is 20 or 30 feet away. For me if the measuring is fairly accurate between 0,5 feet and ~10 feet is more than enough. I don’t want it to be accurate on a mm scale. There is something what I want to ask. I have a few LM258N amplifiers. 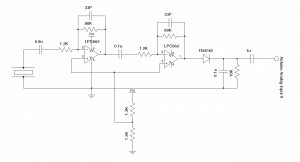 Can I use the intead of the LPC662 or the LM358? Another thing. Can I use the BCV 47 and BCV 46 transistors instead of 2N3904 and 2N3906? Its easyer to me to buy, cheap and can handle mor power (not that I need it), they dissipate less power. You can change the transistors to BCV46, 47 without any issue. 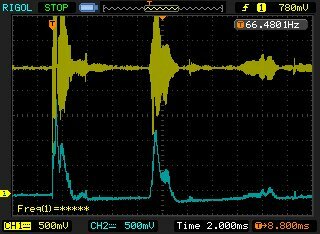 LM258N has a pretty low unit gain bandwidth (around 1MHz) and would not be suitable for this high gain application for the desired bandwidth. You’d need to find an op-amp with a wider bandwidth (e.g. 10 MHz). I am new to this stuff, and wish to build one of these circuits, but with so many different capacitor types could someone please list the types of capacitors that are being used in the receiver circuit. I have seen some circuits that say to use polyester film capacitors as they are more accurate. You can use ceramic ones for capacitors under 1uf. And electrolytic capacitor for the ones with higher capacitance. I want to ask about the detail of the H bridge circuit. Where should I put the additional capacitors and resistors? What capacitors are you referring to? If you are talking about the de-coupling caps then they need to be as close to the circuit where de-coupling is needed. Thanks for this post. I found it interesting if not somewhat difficult since my electronics is weak and programing skill is none. You mention similar products are very expensive, seeing the skill one requires to come up with this, is understandable. Great job!! Thanks again and hope you keep bringing these type of DIY “lessons” to all of us. First of all thanks for sharing your experience. I am wondering how far a person can be detected aproximatly. It would be great if anyone could evaluate it. While the transducers can be driven safely, that particular bridge design would not work with higher voltage than 5V, as the top-right PNP transistor in the schematic would never turn off. And also the arduino output would be shorted (or get current input from a higher voltage source). Good point! Thanks for the feedback! In this case, the drive voltage to the bridge will have to be level-shifted first. I would like to push the range as high as possible. Ill increase the driving voltage to around 12V so I’ll use 2N2222 instead of 2N3904 and 2N2906 instead of 2N3906. Could you post a cct mod that fixes the issues Raron mentioned… (that the bridge design would not work with higher voltage than 5V, as the top-right PNP transistor in the schematic would never turn off and that the arduino output would be shorted). Do you also agree with Jhonny’s comment (February 26, 2011 at 6:55 pm) about getting a better SNR by rearranging the first amplifier as non-inverting and use a high value bias resistor (MOhm) to Vcc/2 ? Would this improve range and accuracy? Are are 40kHz transducers going to improve range, or just accuracy when used instead of 20kHz? Finally, I intend to use a minimal (read ‘cheapest’) PIC/programmer for this project as I’ll be making a bunch of them. Would that be the ATmega168? Are there any other minimal PICs that you would recommend specifically for this task? Thanks, Kwong, for your very informative site and help. To use voltage higher than 5V, you will need to amply the drive signal from 0-5V to 0-Vcc (if you are using 12V then Vcc would be 12V). 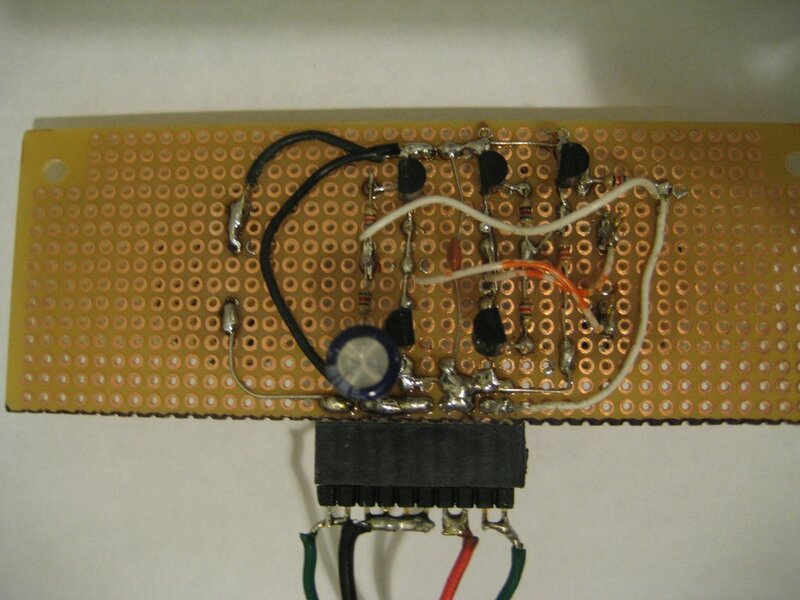 The simplest way to do this is to add a transistor stage so the drive signal would be amplified to 0-Vcc. Yes, if you use a non-inverting arrangement, it would have higher input impedance. I guess that was something I overlooked when I designed the circuit. The frequency of the transducer has little to do with the range (yes, higher frequency will result in slightly better resolution), you might want to check the maximum output power of the transducer and the max drive voltage. If you are going to use PICs, you could use PIC16 and PIC18 chips, but you will have to re-write the code. If you are staying with ATmega, then yes ATmega168 should be sufficient. Can I swap a 2N3904 transistor with a 2N2222 transistor. If I do, will I have to swap all the 2N3904? Or will swapping one 2N3904. Absolutely, 2N2222 has an max Ic of 1A it should be even better. 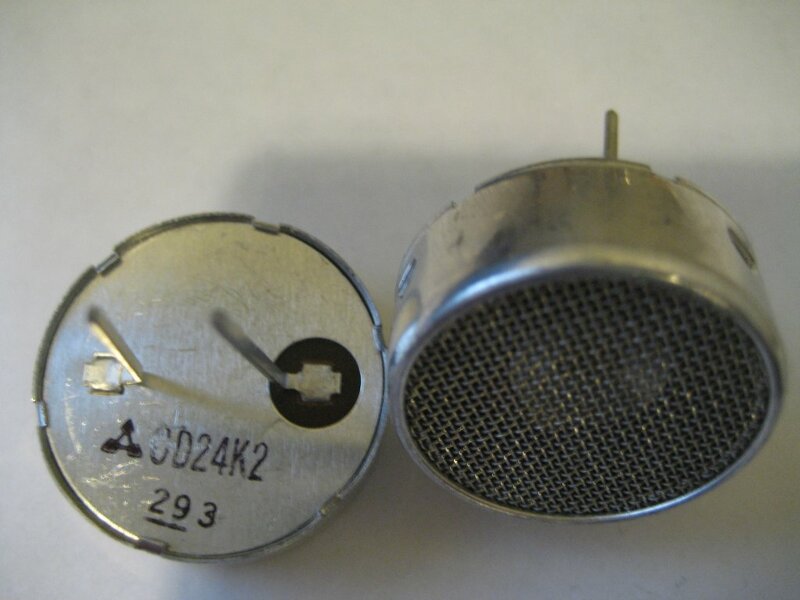 But I’d suggest you use a complementary PNP transistor that has similar specs such as 2N2906 instead of using 2N3906. I wouldn’t recommend just changing one transistor however. sir, can i use my tl072 dual op-amp? and i am planning to connect it to pin3 because pins 11, 10, 6, 5 are used for my motor driver… what part/s of the should i change? thanks for the help.. I don’t think TL072 would work since it requires quite high supply voltage (18V). If you are switching pins, take a look at the code and change the pins in code accordingly. sir, im confused… :) im just new with this stuff. sir kwong, my arduino uses ATmega168, does it also have a 16bit counter? pin 9 belongs to counter 1 sir right? does it mean that i cannot use this PWM pin to my H-Bridge? The counters on ATmega168 and 328 are the same (the only difference between the two is the flash memory size). If you use the PWM pin for the sensor, you will have to use the other PWM pins for your H-bridge. hey the lpc662 chip is there any replacements coz i cant find that chip anywhere!!!?? and there are two outputs for the sensor right? (receiver and transmitter together)? so is there any way we can make it into one output like the pin ultrasonic sensor? What will happen if I use IC NE567 after the op-amps?……Will the output be analog or digital?…..And will i be able to interface it with Arduino then??? Please do reply. Not sure what you were trying to achieve? Thanks for this amazing circuit! I got on to making it immediately when I saw this. It’s much easier than other similar circuits! hi friends kindly help me. i am doing a project in which i need to interface ping)) with telosb which has msp430 processor. and how to write code for it. Can you please explain what are the modification required to achieve 2ft max range sensor using this circuit (GH-311). I’m using 40kHz, and arduino mega. Thank you. Hmm… it can achieve at least 15 to 20 feet of range without any modifications. Ok I’ll try. thank you very much…. sir im a beginner….would you pls give me some idea about the circuit operation,,,,? Hi. I’m actually looking ultrasonic sensor that can used to measure distance between range above 10 meters, or like 10-20 meters. Can sir give a suggestion or is there any others types of ultrasonic sensor that can measures that kind of range that I mentioned? Thanks in advanced. sir is there any replacement for the lpc662 chip coz i cant find that chip anywhere!!!?? and there are two outputs for the sensor right? (receiver and transmitter together)? so is there any way we can make it into one output like the ping ultrasonic sensor?